On May 11, 1908, two or three enterprising local citizens decided to open the bank at night. They accordingly came into town and procured rolls of barbed-wire that were stacked in front of the hardware of Dave Norris. These rolls of wire were put in two or three strategic places and formed a very effective bunker. Several rolls were placed in the Southeast corner of the main street where the lumberyard was located. This was about half a block from where Pop Sloan had board and room. Two other barricades were erected at locations which would prevent the interference of any of the local citizens. In the middle of the night there was a terrific boom. It was caused by nitroglycerine being placed around the edges of the door of the bank safe. Such a blast awakened most of the town, blew the door to the safe wide open, broke the windows, and scattered other items about the bank On hearing the blast, Pop Sloan, who at that moment had more courage than judgement, went out on the top of a second-story window to make an investigation. Of course, he took along a Winchester rifle. I can imagine the picture which he presented as he told me he was sleeping in a long white nightshirt. Immediately upon his stepping outside on the porch, a shot was fired from the barricade near the lumber yard. He returned fire in the general direction, whereupon his roommate, Cleve Chestnut, shouted at him not to be a damn fool and come back inside. 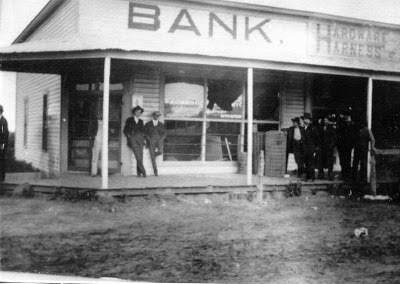 This good advice he heeded and the opening of the bank at night proceeded in a more or less orderly manner. A man who was remotely related by marriage to the Vassar Family was suspected. However, he was never arrested or charged. Two or three years after the bank robbery, the suspect paid another member of the family some $10.00 or $12.00 for labor performed. One of the bills was a $10.00 bill with a slightly charred corner. As far as the family was concerned this was almost an admission of guilt . . . . After some two or three years, the suspect moved from the neighborhood and died during the late thirties. I became quite well acquainted with him during his lifetime.